Brightly polished finish. 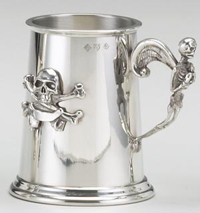 A separately cast skull and crossbones is applied to the body of the tankard. The handle is a separately cast winged skeleton. 5" tall and holds 1 pint. Glass bottom. Made in England.